We can only welcome the discourse that has been initiated in our professional community with the concept of public sociology in the focus. Undoubtedly, Michael Burawoy has indisputable merits in fuelling this international dialogue. I find, however, that his position and conceptual framework is debatable at several points, therefore my review is on the side of those who criticize his ideas. 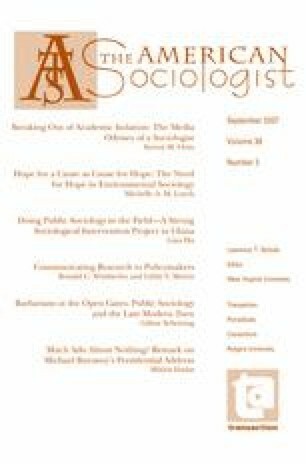 My paper is divided into three parts: in keeping with the idea that the drop mirrors the ocean, I will start with the detailed critique of a single paragraph—the one which makes comments on his table entitled Types of sociological knowledge. It will be argued that by switching his viewpoints and using vaguely defined notions without empirical evidences he often tackles his subject inconsistently. Secondly, I intend to offer an alternative, three-dimensional conceptual model in which the social scientist’s prestige, influence and position on the action chain is taken into account as the main analytical aspects of the relationship between her/him and the public. Finally, based on this model, I propose to identify some strategies in order to find a better balance between the public and professional activity of social scientists. My remarks target Burawoy’s ‘2004 American Sociological Association Presidential address: For public sociology’, The British Journal of Sociology 56 (2): 259–294.